The tower of Pisa is a campanile. “Campanile” is an Italian word which means bell tower. A bell tower is basically designed to have bells or more precisely church bells. The leaning tower of Pisa is therefore a freestanding bell tower that is part of a cathedral. It is the third oldest structure in the Square of Miracles. This square is also known as the Cathedral Square and it contains four religious structures. In Italian, the square is known as Piazza dei Miracoli. It is famous worldwide for its tilt. Previously, the tower was tilted at 5.5-degree angle which is now lowered up to 3.99 degrees thanks to the renovation. 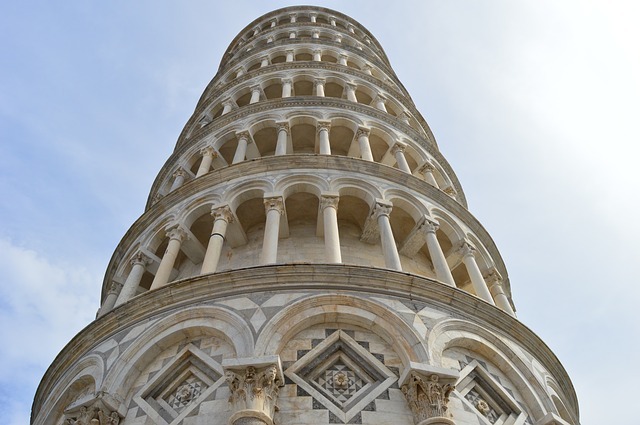 Now let’s dive deep into the leaning tower of Pisa facts for kids and learn more interesting facts about the leaning tower of Pisa! It is widely believed that in about 1590, the Italian scientist Galileo Galilei performed the famous experiment from the tower of Pisa. He had dropped two spheres with unequal masses and proved that the speed at which an object falls is independent of its mass. The tower of Pisa is a part of four historical edifices located inside the square. These ancient religious buildings are classical examples of Romanesque architecture of medieval Europe. They are situated within a square called Square of Miracles (or Piazza dei Miracoli). It is also known as Field of Miracles. The construction was completed in three stages. 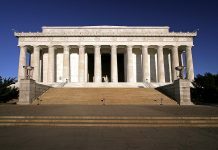 White marble was used in its construction. It took around 199 years to complete the tower of Pisa. The work on the ground floor of the tower was started on August 14, 1173. The tilt of the tower had started when the work on the second floor began in 1178. The construction on the tower was stopped for about 100 years. During this time, the Republic of Pisa was involved in battles with other Italian states of the Republics of Florence, Genoa and Lucca. Since construction did not take place for about a century, it allows the soft soil underneath the sinking side of the tower to settle. That’s why the tower did not fall and it is still standing in a slanted way because the soil has now become hardened enough to withstand the weight of the tower. The clocks were fixed in 1198 on the third floor of the tower. 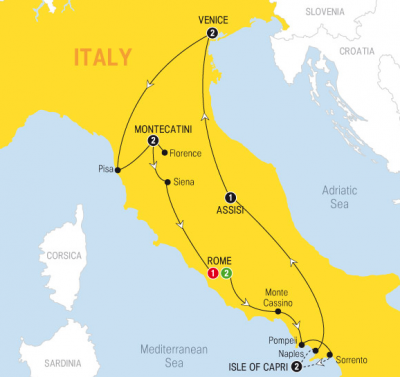 The second phase of the construction began in 1272 by the architect named Giovanni di Simone. By this time, the tower was tilted. For that reason, the engineers started building one side taller than the other while constructing upper floors. Thus, the curve of the tower is due to this. The Battle of Meloria was fought between Republic of Pisa and Republic of Genoa. But the Pisan fleet was crushed and defeated. As a result, the construction on the tower stopped again in 1284. In 1319, the seventh floor of the tower was finished. In 1372, Tommaso di Andrea Pisano made the bell-chamber. The tower contains seven bells. In 1655, the largest bell was installed on it. The story at the bottom of the tower contains 15 arches made up of marble. There are 30 arches on each of the above stories. There are 207 columns in this tower that give it the appearance of a large cake. The tower is about 5 meters away from its vertical position. For about 800 years, the tower had been steadily falling at a rate of 1 millimeter each year until 1990. Finally, engineers have pulled it back about 45 centimeters (17 inches) and stabilized it. According to computer models, the tower should have toppled by the time it reached 5.44 degrees. 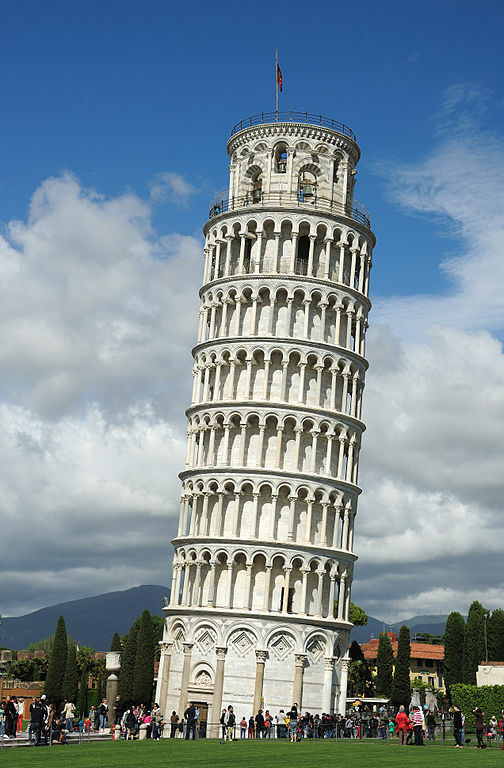 However, in 1990, it kept leaning until it reached 5.5 degrees but still standing. 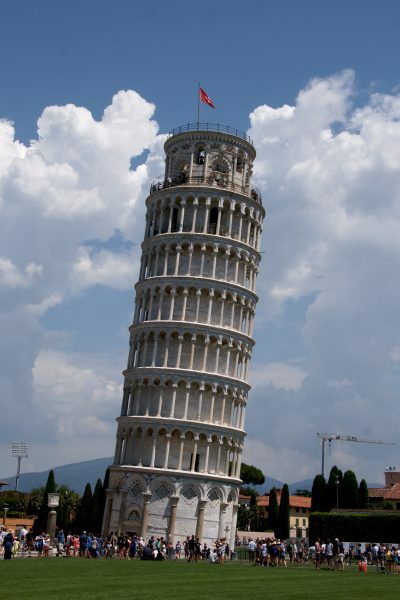 Until 2000, the leaning of tower was fixed by about 16 centimeters. The name of the real architect of the tower has been a matter of debate. It is widely believed that Italian sculptors Gherardo din Gherardo and Bonanno Pisano designed the tower. Pisano was a famous artist of the 12th century. In 1820, his stone-carved corpse was discovered from the foot of the tower. The tower of Pisa is tilted to one side because the soil on that part is unstable due to the mixture of clay and fine sand. Besides, the foundation on this part is also only 3 meters deep. The tower of Pisa is situated within the Square of Miracles in the Italian town of Pisa, close to the Cathedral of Pisa. The tower of Pisa has eight stories. The tower of Pisa contains up to 296 steps spiraling all the way from bottom upwards.